Baking stones are prized by professional bakers and baking enthusiasts for making breads, pizza and pies. The pie and pizza crusts turn out light and crunchy, and it produces light and airy bread loaves due to the even heating the stone radiates. Baking stones can be made from various types of materials including soapstone, clay, brick and marble. Although marble baking stones are not the favorite choice, there are many amateur bakers who swear by it. The plus side to marble is that it is an ideal material for rolling out pizza dough and pie crusts. Prepare your dough for the chosen recipe. Roll out dough or pie crust on your marble baking stone or on a separate slab of marble if you prefer. The marble’s cool, smooth surface helps to prevent sticking. Clean the marble stone with a damp cloth to prepare it for baking use. Do not use soap since marble is porous. The soap will give your baked goods a soapy taste. Place baking stone in a cold oven on the lowest rack if it is electric, or on the floor if it is a gas oven. (A cold oven is important because a sudden change in temperature can cause baking stones of any material to crack or break). Preheat oven to 400°F for about one hour. Check if stone is ready for baking by dropping some water on top of it. If the water sizzles it is ready. 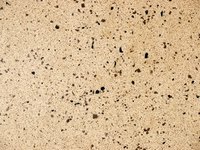 You may sprinkle cornmeal on your baking stone to help prevent sticking, but this is generally not necessary for marble. Place pizza, bread or pie directly on top of stone to bake. Allow baking stone to cool down to room temperature before cleaning it. Do not use marble tiles commonly used for floors or countertops for baking. It is best to purchase marble that has already been prepared for baking purposes, such as those found at a chef's supply store. A 3/4 inch to 1 inch thickness is best. Make sure the marble baking stone is not too large for your oven. There should be at least 2 inches of open space around it on all sides space to allow for proper ventilation and heat flow. When removing the baking stone from the oven, do not place it on a counter top. Be aware the baking stone will stay warm for a long time after removal to avoid getting burned. Avoid exposing the baking stone to sudden temperature changes. This causes cracking and breakage.